The latest version of the Nissan Murano crossover SUV has arrived and should make for the ideal vehicle for active drivers and families. The recently redesigned Murano features a highly modern style, inside and out, from its striking new shape to its high-tech infotainment center. Crossover SUV buyers near Greensboro, NC can explore the new Nissan Murano at Vann York Nissan. You can explore our selection of new Nissan Murano crossovers and 2016 Murano models here on our website or by visiting our dealership in High Point, NC. Once you test drive the restyled and versatile new Murano, your crossover SUV buying decision will be easy! If there is one crossover SUV in this class that feels more modern and upscale, it is the newly redesigned Nissan Murano. From its luxurious and high-tech cabin to its striking exterior design, the new Murano is sure to catch plenty of attention for all the right reasons. Nissan stuck with the classic crossover SUV format of 5-passenger seating with a large cargo area behind the second-row of seats, which provides an ideal mix of roomy passenger space and highly versatile and spacious cargo capacity. Whether you are interested in a 2016 or 2017 Nissan Murano, you will find an impressive array of available interior amenities, including a NissanConnect system with Navigation and Mobile Apps, Nissan's innovative Around View Monitor plus leather-trimmed seating and heated front seats. The spacious and well-appointed new Nissan Murano is ready to transport your family and friends all over Greensboro and beyond in style and comfort! Nissan's powerful yet efficient 'VQ' V6 engine comes standard in every new Nissan Murano and is paired with an Xtronic CVT (continuously variable transmission). A Nissan Intuitive All-Wheel Drive (AWD) system is offered on Nissan's versatile and capable Murano, while front-wheel drive comes as standard. For a powerful and smooth ride in your next crossover, test drive a new Murano at Vann York Nissan. Find your new Nissan Murano at Vann York Nissan today by shopping our online inventory of new Nissan vehicles or visiting our dealership in High Point, NC. While you shop on our website, you can even get pre-qualified for auto financing for your new vehicle purchase! 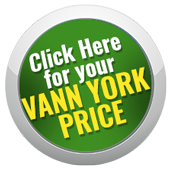 Vann York Nissan serves drivers near Greensboro and High Point, NC with new Nissan and used car sales and financing, professional auto service and genuine Nissan parts.